Frank Fahrenkopf, a Reno native and former chairman of the Republican National Committee, said Monday he will step down as president and chief executive of the American Gaming Association. “There have been dramatic changes to the industry over the last 17 years,” Fahrenkopf said. “When we opened our doors in July of 1995, Native American casinos and riverboats really started taking off. Then it was racinos.” Today, 22 states have commercial casinos with annual revenues topping $35.64 billion. Fahrenkopf’s retirement was planned well in advance. He said planning a transition with the board of directors took two years, and an agreement on his departure date was reached in December 2011. Fahrenkopf said he was “disappointed” but not surprised Congress failed to consider an Internet poker bill last year. Fahrenkopf declined to identify potential successors for the job, which according to Congressional Quarterly paid about $2.6 million in 2010. Analysts name former U.S. Rep. Jon Porter, R-Nev.; former U.S. Rep. Shelley Berkley, D-Nev.; and former Las Vegas Mayor Jan Jones, who is now executive vice president of communications and government affairs with Caesars Entertainment Corp.
Berkley and Porter did not reply to email requests for comment. There may be other candidates. The AGA has retained executive search firm Korn/Ferry International to find a replacement. Fahrenkopf is expected to stay on as a consultant through the end of the year. Fahrenkopf joins Senate Majority Leader Harry Reid, D-Nev., in celebrating 30 years in Washington this year. 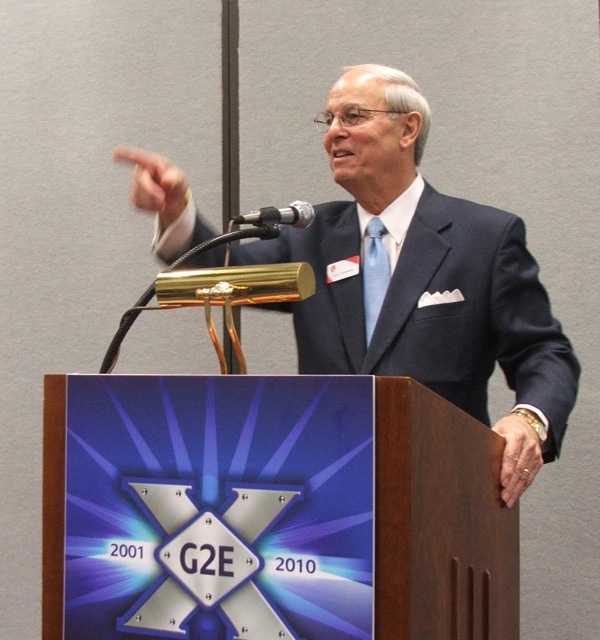 During his tenure as president and CEO of the AGA, Fahrenkopf established the National Center for Responsible Gaming and the Global Gaming Expo in Las Vegas and G2E Asia trade shows. “There’s no doubt that (his) political savvy has been instrumental in protecting and promoting our industry’s interests on Capital Hill, but the impact of his leadership stretches well beyond Washington,” Jim Murren, chairman and CEO of MGM Resorts International, said in a statement. Fahrenkopf graduated from the University of Nevada, Reno in 1962 and received his law degree from the University of California, Berkeley in 1965. He represented clients before the Nevada Gaming Control Board and Gaming Commission as a young attorney. Fahrenkopf was elected chairman of the Republican National Committee in 1983. After leaving the RNC in 1989, he became a partner in the firm of Hogan & Hartson. Fahrenkopf continues to serve as co-chairman of the Commission on Presidential Debates. The AGA serves as the voice of the gaming industry in Washington, representing its members on issues such as online poker, travel promotion and off-reservation gaming. It also operates AGA PAC, a political action committee to support elected officials who can protect the interests of the gaming industry, according to the group’s website. The AGA’s board includes 16 members, including Loveman; Murren; Richard Haddrill, chairman of Bally Technologies Inc.; Virginia McDowell, president and CEO of Isle of Capri Casinos Inc.; and Michael Levin, president and COO of Las Vegas Sands Corp. Contact reporter Chris Sieroty at csieroty@reviewjournal.com or 702-477-3893. Follow @sierotyfeatures on Twitter. Stephens Media Washington Bureau Chief Steve Tetreault contributed to this report. Follow @STetreaultDC on Twitter.